Balcas is one of the largest sawmilling groups in the British Isles with a “state of the art” sawmill in Enniskillen. It has grown rapidly, from an annual turnover of under £10m in 1990/91 to over £70m currently. In 1999, Crescent led a major funding round to finance the development of a new “state of the art” sawmill to significantly boost productivity and capacity. This plant is now fully operational and is achieving its budgeted performance. Among the group’s most recent developments was a Combined Heat & Power plant at its Enniskillen site along with a fuel pellet manufacturing facility: this plant commenced operations in 2005. 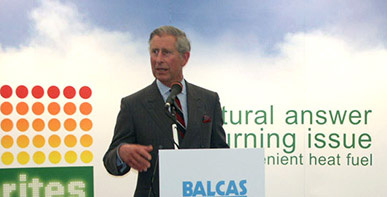 A second larger CHP and pellet manufacturing facility was opened in Scotland in 2009 and Balcas is now the largest producer of wood fuel pellets in the British Isles. Still headquartered in Enniskillen, the Balcas group now employes more than 400 staff accross the firms various operations in Northern Ireland, Republic of Ireland, Scotland and Estonia.